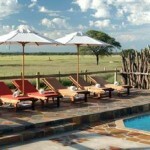 The Frans Indongo Lodge is located in Otjiwarongo, a city in Namibia. This hotel has rooms decorated in the traditional, local style, and a large swimming pool with views towards the savannah. The hotel has fourteen rooms. There are two double rooms, two family rooms and eights chalets that can be transformed into family rooms. 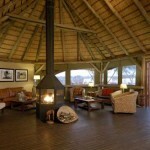 There are two separate individual rooms for safari guides accompanying groups on guided tours. The double rooms have a double bed and traditional Ovambo decorations. Each room has a private bathroom and a basic kitchen area. There are wooden, four-poster beds covered in mosquito netting. The rooms are decorated with antique furniture and clay decorations. There are large earthen pots, woven storage baskets and figurines carved out of wood. 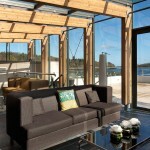 The lodges were built using local materials, including natural stone and reeds. Price is around 61€ for an individual room and 111€ for a double room. The family rooms have a price between 154 and 178€ per night. There are large camping grounds located next to the hotel, in the Frans Indongo Farm. The camping grounds are ideal for tents and have a private space for six guests and three areas that can accommodate groups of up to 20 guests. There are three bathrooms and three shower rooms for women and three bathrooms with three shower rooms for men on the farm territory. Guests will find wood for the camping fires in one of the sheds. These camping grounds are known for their sunsets and their views towards the hills. The hotel has a large wooden observation deck from where guests will be able to see the animals that come to a nearby waterhole, located next to the hotel. There is a tall watchtower nearby, where guests will be able to watch the local birds, some of which can only be seen in the area. The hotel’s designer swimming pool and lounge chairs are located in the gardens, ideal for an afternoon dip with a view. The lodge is decorated in the traditional style of Ovambo houses, There is a large building where the restaurant is located, a separate pool house and the main lodge area. This hotel has a large auditorium where events of up to 60 people can be celebrated. 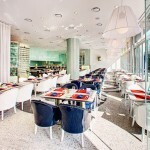 The restaurant can host company outings and family dinners of up to 40 guests. 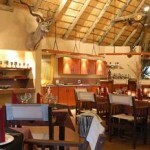 The hotel and lodge are located near Etosha National Park, a short distance away from Windhoek. Guests will be able to enjoy a variety of safaris and visit the Waterberg Plateau Park. 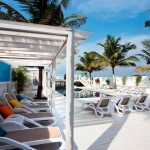 The hotel can organize a variety of trips for guests. There are guided walking tours around the nearby national parks and game hunting tours. It is recommended to visit the nearby city of Otjiwarongo, where a large mineral museum is located. In Okarana guests will be able to visit its cultural center. The hotel organizes jeep tours to the plateau where guests will be able to enjoy the sunset. The Cheetah Conservation Fund is located a short distance away from the hotel. There is a vulture sanctuary nearby. 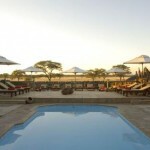 Guests will be able to enjoy a variety of safaris around the region. Bird-watching trips and guided walking tours to see animals can be organized by the hotel. There are three trails that take you around the savannah, offering views from hills crossing the paths of antelopes and other animals. Guests who want to enjoy the views towards Waterberg can climb to the top of nearby hills. Guided trips are organized around Waterberg, and guests will be able to visit the thermal baths and see the cliffs. 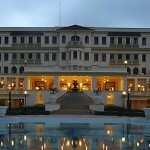 The Polana Serena Hotel is located in Maputo, in Mozambique. The historical hotel has a swimming pool in front of a colonial.style building known for its large rooms. The hotel is one of the most historical buildings in the region. 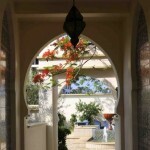 Built in a Portuguese colonial style, the building has several local influences. 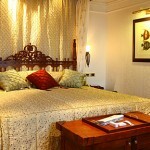 The rooms are decorated with colonial-style antiques and more traditional African decorations. There are 142 rooms in the hotel. There are several suites that have large rooms decorated with antiques and bathrooms with robes for guests. There are fifty standard rooms, five executive rooms, 19 studio rooms, 47 deluxe rooms and 11 large executive rooms. All rooms have double beds, traditional decorations, coffee and tea making machines and WiFi. There are nine executive suites and a large Presidential Suite decorated with antiques. The suites have docks for iPods and espresso machines. 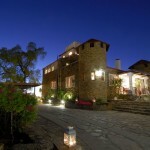 Price is between 281 and 582€ per night. The rooms are decorated with furniture from India and Portugal. There are several antique-style pieces and hand-carved pieces. 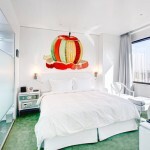 All rooms are white and cream-coloured rooms. There are four-poster beds with wooden headboards covered in silk. Some rooms have city views and other rooms have sea views. This hotel has three restaurants. The Veranda restaurant offers breakfast, lunch and dinner. The Delagoa restaurant offers a variety of French dishes. The Aquarius Sushi Bar is known for its selection of sushi and maki. Guests will be able to enjoy cocktails and wine at the Polana Bar. The Maisha Mind Body and Spirit Health Club and Spa is the hotel’s spa. There is a lounge and a Health Bar where guests will be able to enjoy fresh juices and a variety of teas. The spa has a swimming pool, a steam room, a hall for aerobics and a sauna. The spa has two separate areas for men and women. The hotel has another, larger swimming pool and a garden where guests will be able to enjoy walks. There is a stand in the lobby area where guests will be able to see which trips the hotel offers. There is a lounge that can be transformed into a conference hall for guests who want to celebrate events at the hotel. Guests will find a business center with fax machines, Internet access and photocopying machines next to this hall. Guests will be able to celebrate events at the hotel’s conference halls and in some of the suites. There are four conference halls of varying sizes. The conference halls can accommodate between 14 and 50 guests each. There is a separate banquet hall one another floor. Events of up to 250 guests can be celebrated at the hotel’s Ballroom. This hall is equipped for tele and video conferences. The banquet hall is decorated with crystal chandeliers, columns and high ceilings. The hall has access to a large terrace with views towards the pool. 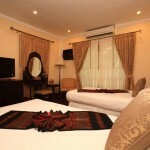 The hotel is located in the city of Maputo. Guests will be able to visit the landmarks and monuments located in the city center, a short distance away from the hotel. The hotel is located in one of the city’s most famous districts, an area filled with mansions and parks. The hotel is located a short ride away from the airport. Guests who choose to stay at the hotel can visit the ancient port and enjoy walks along the promenade. The hotel can organize guided tours and trips around the region. The city and the nearby towns are known for their architecture, which ranges from Arab and Chinese buildings to Indian and South African structures. There are several museum near the hotel. 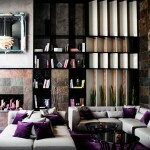 The IP boutique hotel is located in Seoul, in South Korea. This hotel has colourful rooms and a large garden filled with sculptures and statues. This hotel has 133 rooms. 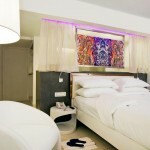 Each room has bright, colourful lights and multicolour furniture, a double bed and a private bathroom. The bathrooms located in the rooms are known for their design, and each one has a bathtub. There are frosted glass showers. All rooms have docks for iPods. The rooms have a flat screen television set and bright, colourful murals. Each rooms has its own colour scheme and is equipped with tea and coffee making machines. There is a white room with a large red painting, and a white room with blue decorations. Another rooms is decorated in shades of green. There are several rooms decorated with murals of exotic animals. Some of the rooms are black and white spaces. There are several types of rooms at this hotel. The Superior rooms are standard double rooms, the Deluxe rooms are larger rooms and the suites have a double room and a living room. There are superior rooms with a double bed and with two twin beds. All rooms have WiFi. Price is between 91 and 205€ per night. The hotel’s restaurant specializes in Korean, Japanese and Western food. The restaurant has colourful leather chairs. The Amiga Café is a buffet where guests will be able to enjoy a variety of international dishes. Champagne and wine are served during dinner. The Deli Amador is a pastry shop that sells a selections of fresh pastries and snacks. The deli is located on the hotel’s territory. Inside the hotel guests will find a variety of art and sculptures. There is a large statue of a knight seated on a horse in the lobby area. One of the halls has a red sofa and murals of colourful squares. The lobby has bright sofas with backs that reach the ceiling. There is a business center where guests can connect to the Internet. The business center has fax machines guests can use. Events can be celebrated in the hotel’s conference hall. Next to the hall guests will find a room filled with game consoles where they will be able to play videogames. The hotel has a gym with a fitness center and several massage rooms. The hotel can organize guided tours and trips around the city of Seoul and has a shuttle service to and from the airport. The hotel can provide guests with limousines. The hotel is located close to the center of Seoul. The Han River is located a short walk away, and guests will be able to enjoy long walks and views towards Nam San Mountain. The hotel has views towards the mountain and the river. Guests will be able to walk around the nearby gardens and climb to the top of the mountain. The hotel is in the center of Itaewon district, a place filled with bars, restaurants and shops. Nearby neighbourhoods are filled with historical attractions, including the Seoul Tower and the Namdaemun Market. The Samsung Musem of Art is another nearby attraction. The Heinitzburg Hotel is located in Windhoek, in Namibia. 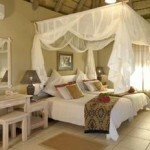 The hotel rooms are decorated with a variety of antiques and the hotel can organize safari tours around the country. The hotel used to be a castle that was built for a count and his wife. The castle is located on a hill that has views towards the city and the Khomas Hochland plains. This hotel has 16 double rooms, and each one of them has its own bathroom. Each room is decorated in a unique manner, with headboards carved out of wood and covered by leather and furniture covered in colourful cloths. The Deluxe rooms have a bathroom with a shower. The Superior rooms have a bathroom with a bathtub and a shower. Ten of the rooms are located in the hotel’s new building, an annex that holds these double rooms, each one with its own bathroom. 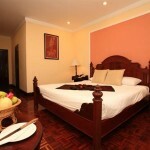 The rooms have large double beds, carved wooden furniture and floors covered in ceramic tiles. 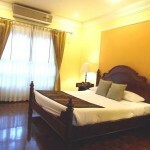 The rooms have television sets, antique sofas and decorations in pastel and neutral colours. Each bathroom is white and has a Victorian style sink. There are individual, double and triple rooms. The hotel has several family rooms that are larger than the rest, with two double rooms and two bathrooms. 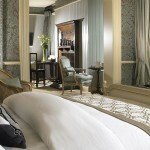 The price for a Deluxe rooms is around 180€ per night. There is a lower price for guests who travel alone and a higher price of around 235€ is the room is transformed into a triple room. 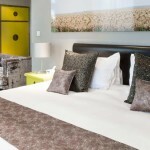 The are two types of Superior Deluxe rooms, those with a double bed and those with two twin beds. Price is around 235€ per night. Price per family room, with two double rooms and two bathrooms, is 335€ per night. The Ritterraum is the Hall of Knights, decorated with antiques. This hall is the hotel’s bar area, where guests will be able to enjoy a variety of cocktails. The Garden Terrace is the hotel’s main terrace, where guests will be able to enjoy lunch and dinner. Fresh pastries are served, direct from the oven’s of the hotel’s pastry shop. The terrace has views towards the city and the mountains. Cocktails are aserved at sunset, and guests will be able to enjoy walks around the gardens. The terrace has access to the hotel’s restaurant. Leo’s at the Castle is the hotel’s restaurant. 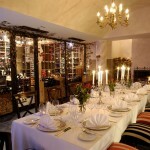 The restaurant is known for its dinners and is decorated with crystal chandeliers and wooden panels. The restaurant offers a variety of traditional local dishes and during dinner guests will be able to enjoy views towards the city. The hotel has its own wine cellar. Guests and visitors will be able to taste wines from Namibia and South Africa. The cellar was built inside a hill and can now be used for events. There is a large swimming pool in the garden. The swimming pool is transformed into a heated pool during the low season. 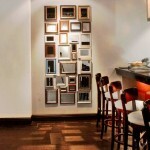 The hotel’s interior is decorated with pieces of art done by local artists. There are several conference halls for events, and events can be celebrated at the wine cellar and the restaurant. The Ritterraum is the hotel’s main conference hall and has its own bar. 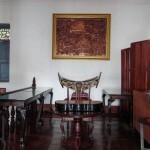 This hall is decorated with antique furniture and several pieces of art. The hotel can organize events and prepare the halls for celebrations. There is Internet connection in most halls, and the hotel can organize a shuttle service to and from the hotel. 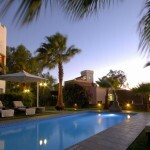 The hotel is located on a hill close to the city of Windhoek. 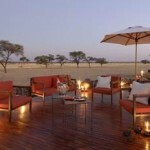 Guests will be able to explore this city and enjoy safaris around the nearby nature reserves. Guests can enjoy walks around the hotel gardens. 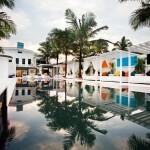 The hotel can organize trips around the city and the nearby towns. Some of the most popular trips are desert trips and hiking trips in the mountains. Guests can tour the region of Khomas Hochland, known for its natural attractions. 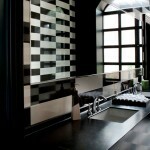 The Eleven Mirrors Hotel is located in Kiev, Ukraine. 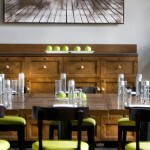 This designer hotel has rooms with large windows towards the historical city center. This hotel has 49 rooms and suites. The rooms are large, with a double bed and a private bathroom, and each room has its own decoration. 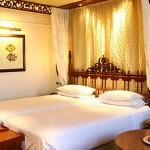 The hotel has large rooms with wooden floors decorated in shades of gold. Each room was designed by a group of local and international designers. The hotel has several types of rooms. Guests can choose between double rooms, deluxe rooms and suites. 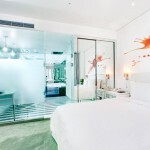 Each room has a minibar and and LCD television set. The superior Incognito rooms are double rooms, some of which have double rooms and some of which have two twin beds. 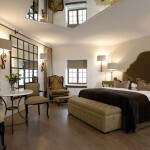 These rooms have views towards the Saint Sofia Cathedral and other ancient buildings in the historical city center. The bathroom is a large glass cube with a shower for two. These rooms have a price of 265€ per night. The Deluxe Desire rooms have a kingsize bed with a grey headboard. Each one of these rooms has floor to ceiling windows and views towards the city. There is a glass table with round chair. The bathroom has a shower. 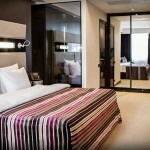 The deluxe rooms have a price of 410€ per night. 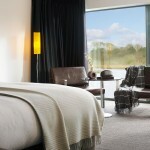 The Signature Premium rooms are dedicated to the elements of air and water, and are decorated in neutral colours. These rooms have views towards the city. Each room has a king-size bed and a sofa. The bathroom, which was built using glass and metal, has a bathtub and a shower for two. 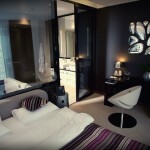 Signature rooms have a price of 455€ per night. 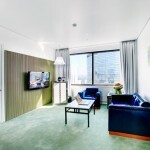 The Lifestyle Executive Suites are two suites located on the hotel’s third and fourth floors. Each suite has a kingsize bed. The suites have a lounge area with a black glass table and white round chairs, and there is a living room with a sofa and a bar that has views towards the city. Each marble bathroom has a bathtub and a shower. There is a restaurant at the hotel. 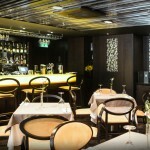 The restaurant has designer furniture, leather chairs, bright purple armchairs and amber decorations. Guests will be able to enjoy buffet breakfasts, lunch menus and dinner. 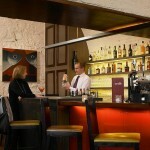 The restaurant offers a variety of international dishes and guests can enjoy a selection of aperitifs after dinner. The hotel’s lounge is located on the first floor of the hotel. This halls has a large decorative chimney. Guests will be able to taste a variety of wines. The Leonardo Wellness Club is the hotel’s gym and spa. The gym is located close to the hotel, and the spa has a large swimming pool and several massage and therapy rooms. The hotel has its own conference center with a photocopying machine and fax machines. The hotel has Internet access in all rooms. The hotel can organize events around the city for guests who want to spend an afternoon enjoying a show. There is a VIP transportation service for guests who want to explore the city by car and helicopter. The hotel is located close to the center of Kiev. Guests will be able to enjoy walks around the city’s historical center, filled with cultural centers and museums. The hotel can organize trips around the city. Guests will be able to cruise in a yacht along the Dnieper river and enjoy guided walks around the city center. The Golden Gate, one of the city’s most famous historical landmarks, is located near the hotel. A short walk away guests will find the Saint Nicholas Cathedral, a Gothic structure located on a popular square. Villa Santi is located in Luang Prabang, in Laos. This hotel is an ancient mansion that was transformed into a family hotel with traditional rooms. This hotel, which used to be an ancient mansion belonging to the Royal Family, now has 25 rooms. Each room is a double room with a private bathroom. There is another resort with 52 rooms next to the hotel. This resort has standard double rooms, suites and two room suites, each one of them with a large bathroom. The hotel rooms are decorated with traditional, handcrafted wooden furniture. The beds are covered with woven bedspreads. Price is between 70 and 193€ per night. Price includes breakfast and a basket filled with fresh fruit. Guests will be able to use the hotel’s shuttle service. 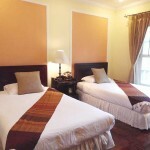 There are two types of Deluxe rooms, those with a double bed and those with two twin beds. Each one of these rooms has a bathtub and a shower. There is a television set and access to WiFi. 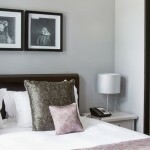 The Junior Suites are large double rooms with a double bed each. The living rooms area has a queensize sofa bed, a television set, tea and coffee making machines and a table with two armchairs. The bathroom has a separate bathtub and shower, and bathrobes are provided for each guest. There are six Royal Suites at the hotel. These suites have a kingsize bed, carved wooden furniture and tea and coffee making machines. Each bathroom has a bathtub with a shower and bathrobes for each guest. The Princess restaurant is the hotel’s main restaurant. Guests will be able to enjoy traditional dishes from Laos and a selection of international dishes. The Wooden House is another restaurant. This one is decorated with traditional furniture and offers regional dishes. The Elephant Garden and Bar is a lounge bar located near the lobby where cocktails are served. Guests will be able to taste local food and a selection of drinks. The lounge is decorated with similar decorations to the ancient royal houses, and there is a balcony with views towards the Royal Sakkarine street. The bar is decorated with lanterns and has its own patio. There is a juice bar and a cocktail bar. There is a large swimming pool on the hotel’s territory. The hotel can organize trips around the city and purchase tickets for guests who want to explore nearby towns. The hotel has a banquet hall where guests will be able to celebrate events. Coffee and tea y served during conferences and other events. This hotel offers a variety of services to its guests. Guests will be able to enjoy barbecues and press is provided in the lobby. The hotel organizes cultural shows. 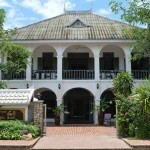 This villa is located in Luang Prabang. A short distance away from the hotel guests will find the Nam Khan River and the Mekong River, and the historical city center is a short walk away. Guests can explore the historical city center, which is filled with ancient monuments. The hotel organizes guided tours around the city. Guests can visit temples and stroll around the famous night market. The airport is located a short distance away from the hotel. The hotel is located in a valley filled with springs that flow towards the Mekong. Valleys and nearby cities can be explored during tours around the region. The hotel has views towards the hille, the mountains and the rice paddies. There are a variety of cultural tours offered by the hotel. Kelebek Hotel is a hotel carved in a cliff located in Goreme, in Turkey. 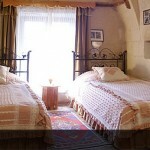 This hotel has fairy chimneys, a stone formation that can be seen in the area, and is decorated with antique furniture. 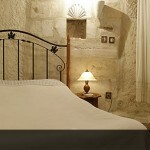 The hotel’s 36 rooms are located in the ancient stone building. This building was built using stone from local quarries and the rooms have been adapted to the natural caves located around the area. The building, which was built during the Middle Ages, follows the natural lines and curves of the caves. Part of the rooms are located inside the caves. There are several types of room, ranging from standard and deluxe rooms to junior suites, suites, king suites and presidential suites. Each room has a large double bed, carved wooden furniture and colourful textiles. Each room has a marble bathroom with a bathroom and a shower. The suites located inside the caves have bathrooms with hammams. The suites have views towards the valley. The three standard rooms have a price of 55€ per night. One of the rooms is located inside a cave, another one has incorporated a stone arch into its layout, and the third one was built using local stone. There are five deluxe rooms. Three of these rooms are decorated with ancient arches and have a kingsize bed each. The room in the cave has a large kingsize bed. The two stone rooms have large kingsize beds. Price is around 70€ per night. 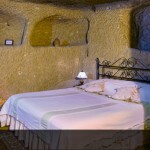 The hotel’s triple rooms is located inside an ancient cave. There are three individual beds and the price per room is around 85€ per night. The Junior Suites have a double room each, a large bathroom and a living room area. Part of the suites have a chimney. Price is around 85€ per night. Rooms 9 and 10 are twin rooms, with two individual beds each. Rooms 4, 13, 15, 113, 114 and 115 have a kingsize bed. Suites 18 and 19 have their own fireplace. The six suites are located next to the hotel’s rose garden. The suites were carved directly inside the mountain, adapting to the curves of the natural caves. Each suite has a chimney and the bathrooms have showers and jacuzzi tubs. Price is around 105€ per night. Suite 17 is a room where the hay used to be stacked. Suite 102 is an ancient stable and 103 was part of the stable. Suite 104 used to be one of the halls of the main mansion, and 105 was the mansion’s living room. Suite 106 used to be the cellar. 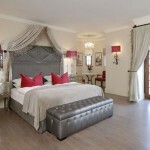 The King Suites are three suites located in another mansion, in the middle of the rose garden. Each suite has an iPod dock, a safe, an LCD television screen and a large bathroom with a bathtub. Suite 107 is part of the stone mansion, suite 108 was part of the vineyard, and suite 109 has a large balcony. Price is around 135€ per night. 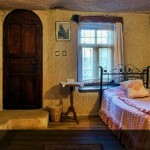 The Fairy Chimney rooms are located inside the hotel’s natural fairy chimneys. These two rooms have a cost of 55€ per night. This hotel has three Presidential suites. 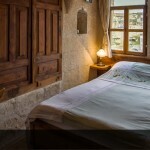 The Divanhane suite is decorated in a traditional way and costs 140€ per night. 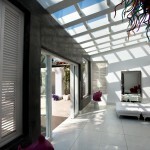 The Pacha suite is a stone suite with a price of 160€ per night. The Heritage Cave Suite is one of the most ancient suites, carved into the natural cave, and guests have to pay 160€ per night to stay at this room. The hotel’s other large suite is the Eagle’s Nest Suite, a suite decorated with wooden carvings and a price of 180€ per night. The hotel’s restaurant specializes in traditional food from the region of Cappadocia. Guests will be able to enjoy lunch and dinner. The nearby bars is known for its selection of local wine. This hotel offers many services to its guests. Guests will be able to relax at the local hammam, the traditional Turkish baths. This hammam is located inside one of the caves, and next to it guests will find a massage room and a sauna. 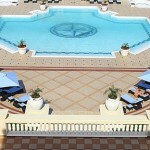 THe hotel has a swimming pool decorated with the mosaic of an ancient map by the Turkish sailor Piri Reis. There is Internet connection available at the hotel’s restaurant and terrace. Guests will be able to walk around the hotel gardens and enjoy views from the terraces. The hotel is located in the northern part of Goreme, close to the historical city center. The hotel can arrange to pick-up guests from the closest stations and the local airport. This hotel can organize trips to nearby valleys, known for their views towards the natural formations and fairy chimneys. Group events can be celebrated at the hotel, ranging from trips around the city to trips and breakfast picnics in the nearby valleys. The hotel is located near Goreme, a town in the region of Cappadocia. Guests will be able to explore the nearby towns and valleys, known for their views. Guests will be able to visit the nearby historical caves. 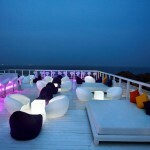 The hotel’s terrace offers views towards Cavusin and Uchisar, a view worth waiting for. There are several other nearby towns located a short distance away from the hotel.